While Farm Bureau does not make any scientific claims about the data, it is an informal gauge of price trends around the nation. A total of 141 volunteer shoppers from 35 states participated in this year’s survey. Farm Bureau’s survey menu has remained unchanged since 1986 to allow for consistent price comparisons. In other words, they ask real people to buy a fixed basket of goods each year to find out how much prices have risen and that number comes in at 13%. But how can that be when the government tells us that food inflation is about 4.7% this year. Perhaps, it’s because the hapless shoppers at the AFBF can’t put hedonics, substitution and weighting in their shopping carts. In other news, that drive to Grandma’s will be 17% more expensive, as average gas prices have gone from $2.87 to $3.35 over the past year. But never fear, the feds assure us that the all important “core” CPI (which excludes superfluous items like food and energy) is only up 2.1% year over year– right on track with their targets. With these seemingly crazy price rises it’s understandable that many people may not realize that the cost of a Thanksgiving dinner is actually down 10% from last year. (That is, if you save your money in gold, instead of green pieces of paper.) This year, a full Thanksgiving dinner for ten people can be had for less than .03 ounces of gold. In fact, since the AFBF study began in 1986, the price of a turkey dinner has fallen by 60% in terms of gold while it has risen 71% in dollar terms. So my question to you, dear reader, is this: Are you still saving money in dollars? Why? It’s time to stop thinking of gold and silver as “investments” and think of them as what they really are– money. Obviously, you need some cash to pay your bills and handle your day-to-day expenses, but for the money you are socking away as savings, doesn’t it make sense to save in a currency that doesn’t lose value every year? 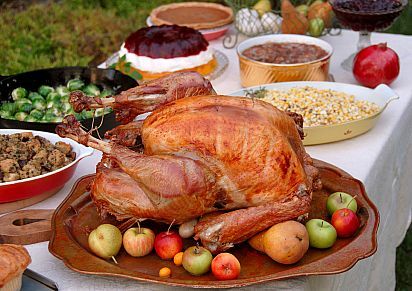 If you save in gold and silver, next year’s Thanksgiving dinner could be 10% more bountiful. With Black Friday approaching, instead of running out to the store for the latest gadget from China that will end up in your garage, consider picking up some silver coins or ingots to slip in your loved ones’ stockings. Or perhaps a shiny gold coin for that special someone. And be sure to check out the Liberty Insight “Money” page to understand why “cash is trash” (as Robert Kiyosaki says) and gold is the ultimate money. This entry was posted in Economy, Investing and tagged American Farm Bureau, CPI, dollar, gold, hedonics, inflation, silver, Thanksgiving, Thanksgiving dinner. Bookmark the permalink.